Damn it. I moved into The Metro Apartments (9th and Marquette) a year and a half ago, hoping I'd get to watch this go up from my south-facing window. I moved out last month, assuming it was gone forever. Alas. Good to see it's still alive, even if it's a little frustrating that it shrank. So they are still pretending to save the facade of the old building. weird. Coming soon, Early fall...What is coming this fall? Groundbreaking. I don't think they can have this done is 10 months. Like more residents in this area, but the design looks cheap, but I guess that is their style based on the Detroit and Kansas City renderings. Maybe this will encourage a tall, slender tower across the street. Could be wrong, but was it said at one point that there would be alot of Micro Apartments in this building? I thaught i remember that from the origional proposal. I guess we'll get to see soon enough. I believe this has to go back before the planning commission, because they waited so long. There were a bunch of micro units in the original proposal. We haven't seen floor plans for the updated proposal, but it's two stories shorter with 18 more units than the original, so it seems safe to assume that it's switched to mostly micro units. We'll see when they submit new CPC plans. I was just thinking this as well. Wouldn't it have to go back because they changed the plans? They don't just approve a general plan, they approved a specific design, right? The Farmington Hills, Mich.-based firm has already taken out a permit for soil disturbance associated with a wrecking project and the city is reviewing a building permit, said spokeswoman Sarah McKenzie. No demolition is allowed to begin before the Super Bowl, per city rules. 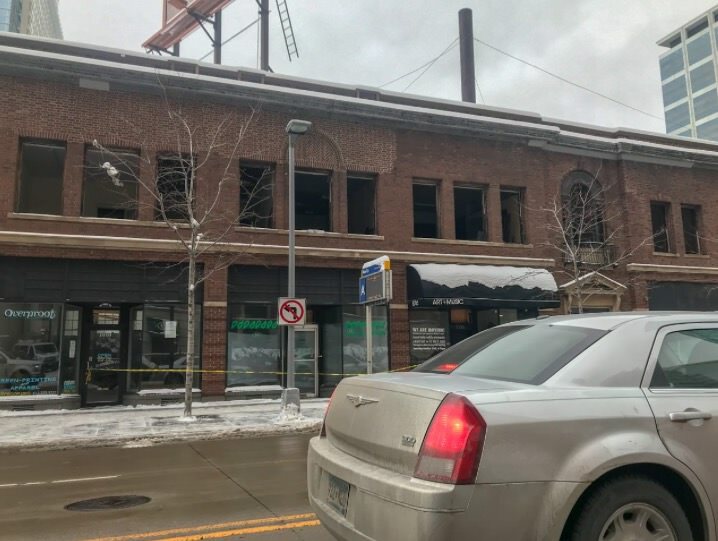 This morning (or late last night) they began removing the upper windows. 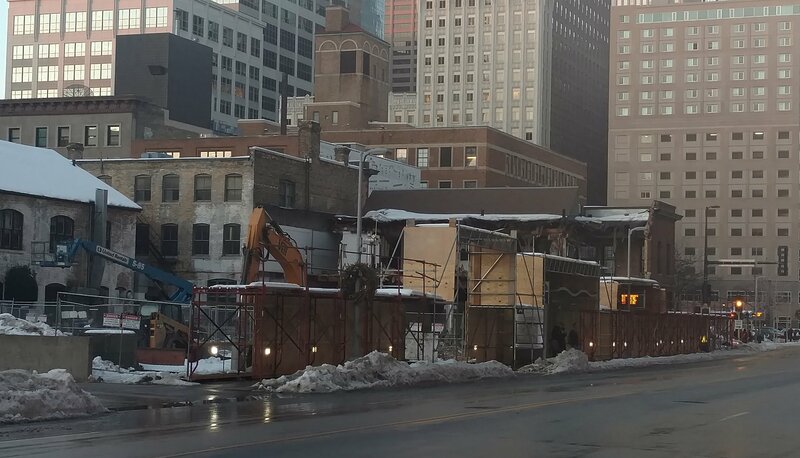 I believe there is a moratorium on any demolition before the Super Bowl so it looks like the visitors to the Hilton are either going to view a boarded up building or a windowless one. An atrocity. This city never learns. It is stuff like this that makes people hate development. Ugh. I shot a music video on the roof of this building a few years ago, and we had to climb through an open window to get out there. The upper floors were an amazingly eclectic mix of small offices and studios. Going through there felt like walking through the bad part of town in a film noir to get to the private eye. So many of the building's original finishings were still in place. There is nothing else like this left downtown. This one really bums me out. I know there are issues of landownership, so you can't force a developer to build their building on an already empty lot (like, right across the street! ), but I wish there could have been some incentives to urge them to look elsewhere. We have lost so much of our architectural history, does this city never learn from past mistakes??? Add another photo to Lost Twin Cities. Partially. The original Handicraft Guild (the portion where Devil's Advocate was) is protected (and hence will be incorporated into this building as communal space or whatever), but the portion along Marquette is not. Right, but I guess I thought the portion along Marquette was reviewed for historical protection and rejected. Not sure where I got that. I'm sure it's in this thread, but there were some pretty bizarre and lawsuity twists and turns to the HPC review of these properties, right?